Here's a sampling of the Commercial, Retail and Bar project designs we have worked on. This client came to us to create a vision for the empty commercial space they purchased in our neighborhood. We mocked up a few different design schemes that could work to transform the space on a limited budget, helped with logo design and made a few custom pieces of furniture to add to the space. The business is now flourishing and adding a rich environment for shopping and classes in our neighborhood. This restaurant/bar on the east coast was already under construction when they sought us out for some custom furniture. In the midst of our conversations we did a bit of redesign/re-envisioning of what the furniture in the space could do for the overall spacial feel. The result was a warm industrial modern collection of fixed booths, movable tables and intimate small tables to fit all manner of guests during the course of an evening. 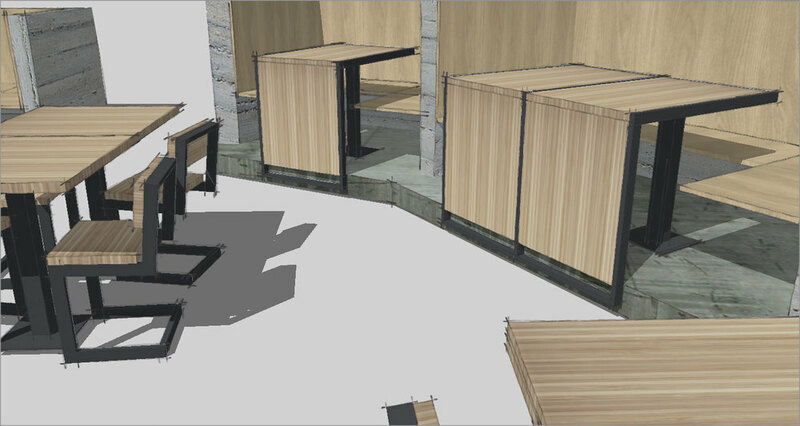 zenbox will be in charge of fabrication of all the above pieces when the space is ready to prep for opening. Serving up Style is the annual fundraising event for Molly’s Fund Fighting lupus and takes place at the annual Portland Fall Home and Garden Show. We were invited to join the list of designers asked to design and construct a “dining” showcase for the 2014 Serving up Style event. Our take on requirements was to craft an indoor/outdoor scene that would remind viewers of a perfect fall evening in the pacific northwest, complete with a tiny teardrop camper, cocktails and an outdoor fire pit. 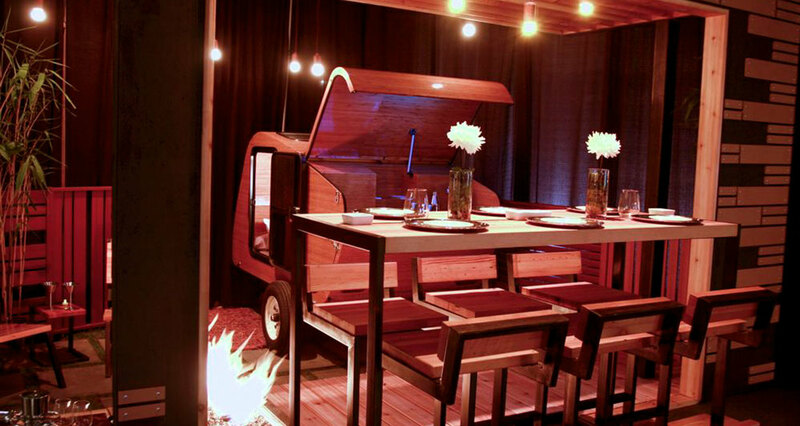 zenbox designed the space and built the camper, outdoor seating, indoor table and stools and the wood and steel pergola. Most of the space was built using reclaimed materials and all materials and objects used in the show were reused in other projects after the show closed. 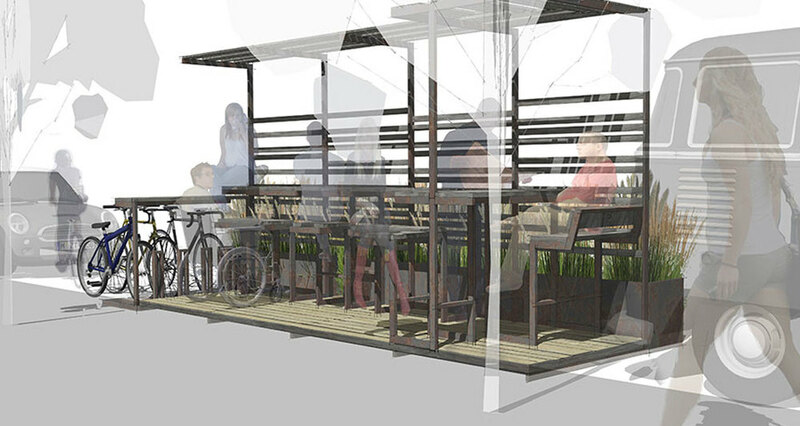 This project was a submission for the Center for Architecture Design|Build Program: Street Seats Competition 2014. We have long admired the Portland’s proactive stance on urban programs like Street Seats, which continue the city’s tradition of innovation in urban planning. We were excited to have the opportunity to design our own take on the shared streetscape. – a collection or gathering of things or people. – a machine or object made of pieces fitted together. – a work of art made by grouping found or unrelated objects. In this case we chose to adopt the simple palette of rusted steel and reclaimed wood from the site to assemble our urban oasis. The assemblage takes the form of a single articulating band of steel that becomes a collection of bar height seating and standing tables intended to allow use from various positions. The floating stools also function as fully accessible tables when needed. The table level can be used as seating, as well as a working/reading space from both seated and standing position. The collection of individual and group seating is intended to do exactly what the assemblage is intended to do – gather people together. The stool and table structure extends upward framing a filtered screen to the street as well as a shading device for enjoying those perfect portland summer days. In final application polycarbonate sheets could be added to provide protection from winter weather as well. The visual screen from the street is enhanced by steel planter box and a row of tall grasses, still allowing visual connection to the street but providing a natural break from the speed and chaos beyond. On one or both ends the steel band lowers into an undulating bike rack that provides both separation and a degree of safety from parking cars. The assemblage is both rugged and lightweight both modern and industrial, both a collection of objects and of people. The tatami room was designed as one of several creative spaces included in a corporate office redesign. This space provides a peaceful escape for employees or an intimate meeting space with clients visiting the office. The tatami room was laid out according to traditional ratios but crafted locally. Imported tatami mats line the floor and handcrafted shoji screens set the room apart from the modern office that surrounds it. Stones were carefully placed outside to help transition to the zen-like space and a cast kanji handle to the nearby entryway hints at what’s to come. The design and specs were eventually handed over to another local craftsman for construction. The second in a series of creative work/meeting spaces in a formal office environment. The space is used primarily for hosting educational clients from around the glove and focused on a rustic lodge setting contrasted with the playful “dr. suess-ian” sculptures lining the walls. The result is a comfortable, relaxing area to seek a bit of playful creativity or relaxation during the workday or in between meetings.